Tank Size required is based on space required for pump & motor assembly and amount of oil required for operation. All dimensions may vary slightly due to assembly tolerances. 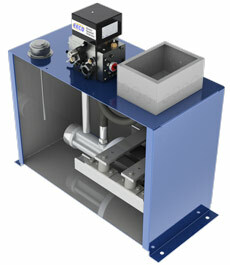 All units are designed to be mounted on 3/4” (2 cm) thick isolation pads. Overall height when set is, therefore, 3/4” higher. Actual “Usable Oil” has an allowance for 10 Gal. (38 Liters) of reserve oil. "Usable Oil" and "Oil Required to Fill Tank" are based on standard tank heights. If greater oil volume is required, the tank height can be increased accordingly. 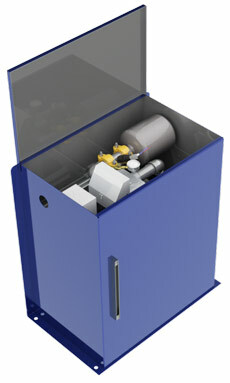 Power Units are furnished with EECO control valves as a standard. Other manufacturers' control valves can be substituted, if required. All units are designed and constructed in accordance with applicable requirements of ASME A17.1 / CSA B44. A grooved outlet is standard. A male threaded outlet is available. 2 ½ hp (1.9 kW) up to 50 hp (37.3 kW) for single submersible pump / motor combinations. 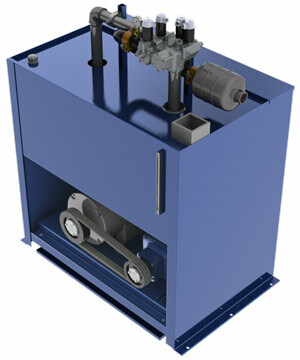 5 hp (3.7 kW) thru 100 hp (74.6 kW) for single belt drive pump / motor combinations. Submersible - 3 gpm (15 lpm) up to 255 gpm (852 lpm). Belt Drive - 15 gpm (57 lpm) thru 500 gpm (1893 lpm). Varies depending on car speed and gross load. Recommended Operating Fluid: Use a good brand of ISO VG 32 turbine oil with a viscosity of 150 ssu @ 100o F (38o C). A minus pour point is recommended. Biodegradable (vegetable) oil is acceptable if it meets the same specifications.A biodegradable (vegetable)oil that does not contain a high acidic property is acceptable if it meets the same specifications. All EECO Products are “Green Compatible” as a standard when used with biodegradable (vegetable) oils that do not contain a high acidic property.